Tasks are items that need to be assigned and accomplished in order to accomplish the program in question. These items could represent activities in a project plan or they could represent a list of “to-do's”. Tasks can be assigned to yourself or they can be assigned to other members of your Workspace. While Tasks were once an integral part of WizeHive, they are now one of the more outdated features and can not be used to automate events or send reminders. List: Identifies the List or Group that the task is a part of. Lists are defined by the administrator. Due Date: Identifies the due date by which the stated task must be completed. Repeat Task: Identifies whether the task should be repeated. Attach Files: You can also attach files to Tasks if there are instructions or other information that is important for the assigned resource to be aware of in completing the task. When a task is marked complete a line will be placed through it. This status is kept on the screen so that the tasks that have been completed are still visible to the member who may have created the task and assigned it. The user has complete control over whether completed tasks should be visible by modifying the display for the Task screen. More on this can be found in the section entitled Layout Options. When clicking Layout Options you will be presented with the following options that control the chart of tasks. Color By: You can select to have tasks that share given characteristics to have the same color. For example, if you select to color by priority, all tasks of priority 1 might be green, while tasks of priority 2 could be red. 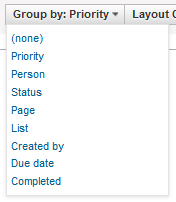 Clicking on this will provide you with a dropdown menu that lets you select whether you want to view everyone's tasks or only your own.